July 11, 2015  Sam Beam, also known as Iron & Wine, and Band of Horses frontman Ben Bridwell have been friends for a while. Now, they've come together to make an album of covers called Sing Into My Mouth. July 28, 2014  A group with cinematic sweep hardwired into its sound, Band of Horses is tailor-made for outdoor performances. 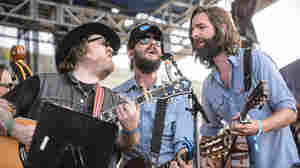 The group performed at the Newport Folk Festival on Friday, July 25. 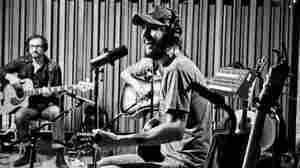 March 3, 2014  Ben Bridwell, Ryan Monroe and Tyler Ramsey are performing their old hits in a new fashion: huddled around a single microphone. Enjoy "No One's Gonna Love You" in a way you haven't heard it before. 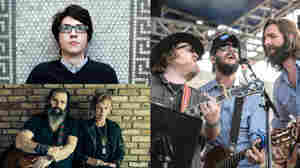 August 17, 2012  Hear the indie rock band's performance from World Cafe Live in Philadelphia including songs from their new album Mirage Rock, out September 18. 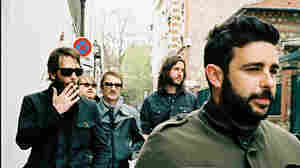 November 1, 2007  Moving from Seattle back home to Charleston, S.C. hardly seems like a good career move, but indie-rock band Band of Horses have taken the transition into account on their new album, Cease to Begin. 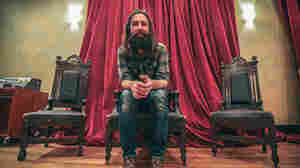 Hear a performance recorded live at CMJ by KEXP. March 7, 2008  For all its impeccably timed swoony grandeur, Band of Horses' Cease to Begin peaks during its subtlest moment: a sweetly lazy ballad with the inexplicable title "Detlef Schrempf." The song is a study in rich, friendly atmosphere. October 9, 2007  Esquire music critic Andy Langer looks at new records from Band of Horses, Kid Rock, Sharon Jones & the Dap Kings and Deana Carter. 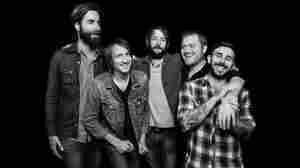 October 12, 2007  The critically acclaimed rock group Band of Horses has roots in South Carolina. But the band formed, made its name and recorded its first CD in Seattle. 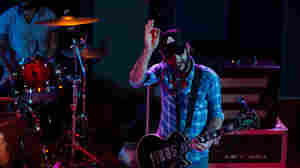 Now its members are back in the Palmetto State, and back with a new album called Cease to Begin. December 6, 2006  NPR station KEXP is an influential and innovative cultural force in Seattle and beyond. Kevin Cole — host of Afternoon Show, which highlights new releases, previews, vintage tracks, rarities, B-sides and in-studio performances — compiled this list of notable debuts. March 8, 2006  Band of Horses, founded by former Carissa's Wierd [sic] members Benjamin Bridwell and Mat Brooke, makes its debut with an amazing amalgam of psychedelic pop and epic, intense rock that recalls the expansiveness of The Flaming Lips. September 27, 2010  "Older" finds singer Ryan Monroe pining for a love that remains the same, no matter what goes on around it. "After all my plans, they melt into the sand / Yeah, you will be there on my mind through all," he sings, before adding, "Don't want to understand why you never get older." There's not much more to "Older" than that -- the band runs through the chorus five times in a three-and-a-half-minute song -- but there needn't be. 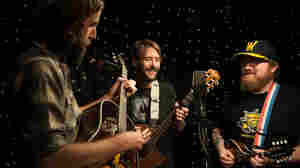 May 28, 2010  The alt-country band's new record mixes the sound of the Minnesota wilderness and the hills of the Carolinas with soaring strings. It's not surprising given the group wrote and recorded the album in many locations: in northern Minnesota, the Carolinas, Muscle Shoals in Alabama, the Mojave Desert and Hollywood. April 20, 2006  Old friends make new music in The Raconteurs; Seattle's melancholy Band of Horses; An artful love song from Ian Love; New folk from the 18th Day of May and more.